As promised, Honda has finally unveiled the second-generation Honda NSX in its spectacular production-bound form at the North American International Auto Show 2015. 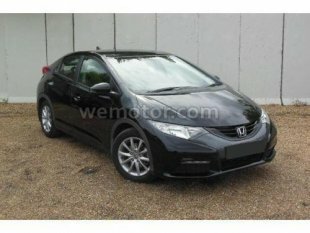 With updated design and specs, the mid-engine hybrid sports car is open for bookings again after Honda stopped accepting orders last year. Compared to the concept, which had been teased time after time during its development stage, the production NSX bears quite a number of changes in terms of styling and mechanicals. The car has been tested extensively at the company’s state-of-the-art wind tunnel in Ohio, leading to significant changes from the 2013 concept to the final body design. 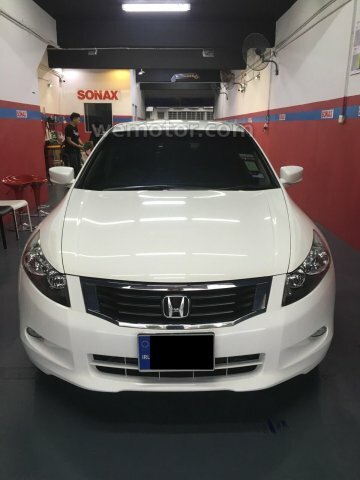 For instance, the front fascia gets a reworked bumper with new intakes on both sides, new hood vents and front splitter as well as sharper headlight design. Moving to the sides, the size of the intakes at the C-pillar has has been increased to collect more air for the engine. The rear section retains the boomerang-shaped taillights but sports restyled bumper along with an Aventador-style central tailpipe. Not only that, the NSX has also grown in size. Measuring at 4,470 mm in length, 1,940 mm in width and 1,215 in height, the production model is actually 80 mm longer, 25 mm wider and 15 mm taller over the concept. The wheelbase has also been increased from 2,610 mm to 2,630 mm. That said, measurement of front and rear tracks remain unchanged. Beneath the handsomely sculpted aluminium/sheet moulding composite (SMC) body panels is a space frame that is made of aluminium, ultra-high strength steel and “other advanced materials.” The structure is anchored by a carbon fibre floor, resulting in a more rigid construction. The cabin a.k.a Human Support Cockpit has been completely revamped to provide better visibility and use of space and ergonomics. 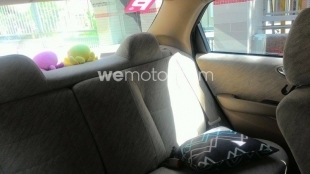 The seats are said to feature immense holding performance while the A-pillar is made as thin as possible to avoid view blockage. The cabin is also fitted with a low-mounted instrument panel, which holds the TFT LCD display and a Power button that readies the hybrid drivetrain located in the centre console. At the heart of the NSX is the quirky-named Super-Handling All-Wheel Drive (SH-AWD) powertrain that consists of a twin-turbo V6 and three electric motors – one on the rear axle to assist in acceleration, braking and gear shifts and two on on the front axle to provide dynamic torque vectoring. Coupled to a new nine-speed dual clutch transmission, the drivetrain makes a combined output of more than 550 hp. It employs a fully independent, all-aluminum front and rear suspension and carbon ceramic brakes with six and four-piston monoblock calipers. 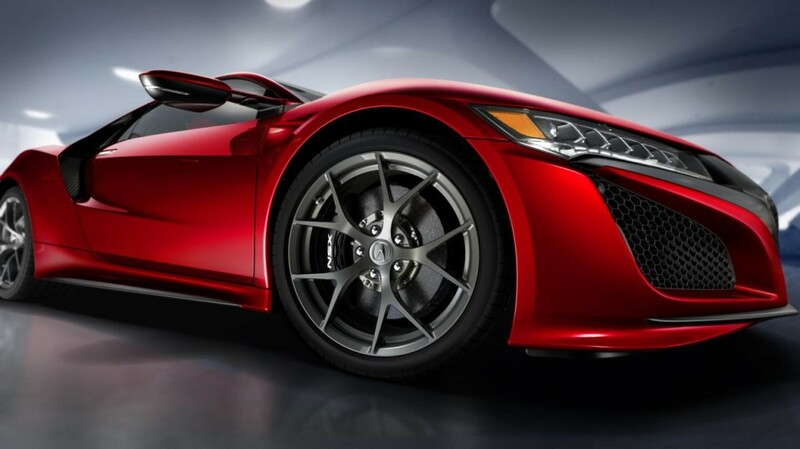 The NSX wears 19-inch (front) and 20-inch (rear) aluminium alloy wheels shod with ContiSportContact tyres. As confirmed back in 2013, production of the Honda NSX will be carried out at the company’s Performance Manufacturing Centre (PMC) in Ohio with first deliveries expected later this year. 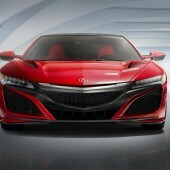 Twenty-five years after the debut of the original, paradigm-shifting NSX supercar, Acura revealed the production version of its highly anticipated successor—the next-generation Acura NSX, developed and produced in the U.S.—to the world’s auto media at the 2015 North American International Auto Show today. 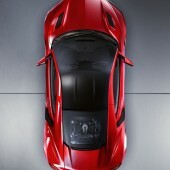 The production model, in a scintillating NSX Red finish, took the stage with a growl from its twin-turbocharged engine. 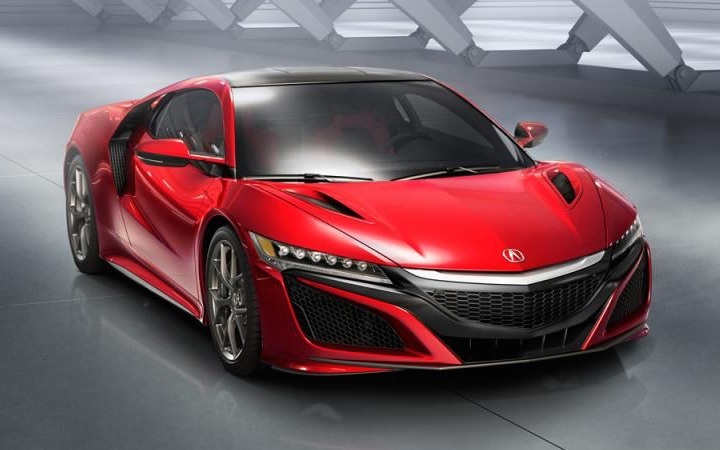 The next generation NSX showcases the production styling, design and specifications of Acura’s mid-engine sports hybrid supercar, and Acura announced key details of the all-new vehicle’s design and performance. The company will begin accepting custom orders for the new NSX starting in the summer, with customer deliveries expected later in the year. Specifically created to bring a “new sports experience” to the supercar segment, the NSX challenges conventional beliefs about supercars — much as the first generation did a quarter century ago. The approach is realized through an all-new power unit—a twin-turbocharged 75-degree DOHC V6 engine with a 9-speed dual clutch transmission (DCT) and three-electric motor Sport Hybrid system—integrated with an ultra-rigid and lightweight multi-material body with world’s-first material applications and manufacturing processes. Developed under the concept of a “human-centered supercar,” a car that puts the driver first in every aspect of its design, the next-generation NSX will leverage its state-of-the-art hybrid supercar power unit, body and chassis to deliver exceptionally intuitive and immediate response to driver inputs. As the pinnacle representation of Acura performance and prestige, the NSX was introduced at the auto show under the theme of “Precision Crafted Performance.” The theme was the original tagline for the Acura brand, a guiding force behind the development of the original NSX and a critical component of its launch. 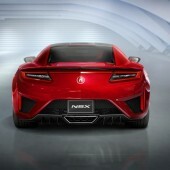 The development of next-generation NSX, driven by precision crafted performance, has resulted in a clean-sheet design, which involved nearly three years of intensive development effort by a global design and engineering team led by engineers at the company’s development center in Raymond, Ohio. “The NSX reflects Acura’s American roots and makes a powerful statement about the strong role being played by our North American operations in envisioning and building the future of Acura,” said Erik Berkman, executive vice president of the Acura Business Planning Office. Every element of the exterior body design has been carefully fashioned for total airflow management for both stability-enhancing downforce and vehicle systems cooling. The NSX has undergone extensive testing at the company’s state-of-the-art wind tunnel in Raymond, Ohio, leading to a number of significant changes from concept to final body design, including modified hood vents, new front fender vents, modified side air intakes, and an optimized deck spoiler. The NSX’s instrument cluster features a dynamic TFT display that responds to changes in the driver-selectable Integrated Dynamics System with pertinent graphics and information. The center console holds the Power button that readies the sport hybrid powertrain, nested in the center of the new Integrated Dynamics System dial control. Interwoven under the handcrafted leather dash panel is the exposed midframe—a functioning chassis structural member that reflects the design aesthetic of a naked sport bike. An ultra-thin, yet super strong A-pillar design and low-mounted instrument panel minimize obstructions to the driver’s view of the road. Acura engineers leveraged the company’s expertise both with high-performance engine and hybrid electric-drive technologies, as well as its two decades of experience with industry-leading dynamic torque-vectoring technologies, including Super-Handling All-Wheel Drive (SH-AWD), to create the most sophisticated, technologically advanced and intelligent powertrain in the supercar universe. At the heart of the NSX’s performance capabilities is an all-new mid-mounted, 75-degree, DOHC V6 engine with twin turbochargers mated to an Acura-developed 9-speed DCT. The V6 engine employs a race-inspired compact valve train and dry sump lubrication system to help lower the center of gravity. The all-new 9-speed DCT delivers synapse-quick gear changes and rev-matching downshifts. 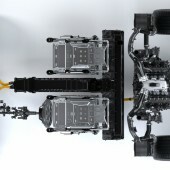 The rear direct-drive electric motor, housed between the engine and transmission, supports acceleration, braking and transmission shifting performance. 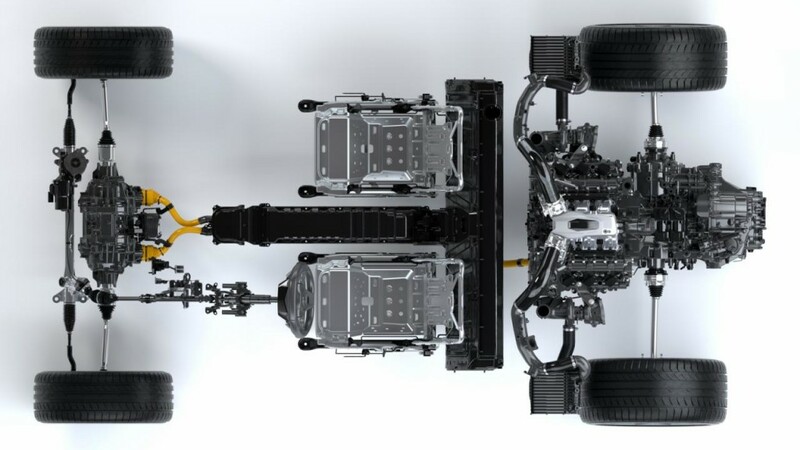 The NSX’s front wheels are driven by twin independent high-output electric motors which deliver instantaneous torque response and dynamic left-to-right torque distribution. The NSX uses its front electric motors for dynamic torque vectoring in addition to enhancing acceleration and braking performance. The result is an instantaneous “zero delay” launch performance and handling response that seems to anticipate the driver’s desire. The NSX has undergone extensive testing at some of the world’s most challenging race circuits, including the famed Nurburgring. Also in keeping with the legacy of NSX—the world’s first all-aluminum supercar—the new NSX features an innovative new multi-material body design with world’s-first material applications and construction processes. The NSX features world’s-first casting technology that combines the design and manufacturing flexibility of a casting process with the strength and elongation properties of a forged material, enabling significant weight reduction. The body panels are composed of a combination of aluminum and sheet molding composite (SMC). 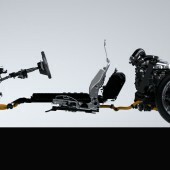 The NSX features an “Advanced Sports Package” with placement of key powertrain components –the mid-mounted engine, twin front motors and Sport Hybrid battery pack and power control unit – optimized to concentrate vehicle mass low and toward the center of the vehicle, to further enhance dynamic response. The combination of this packaging concept and the lightweight body give the NSX the lowest center of gravity in its class. The NSX utilizes a fully independent, all-aluminum front and rear suspension and puts its considerable power down through ContiSportContact™ high-performance tires—245/35Z R19 front and 295/30Z R20 rear—mounted on 19×8.5 inch front and 20×11 inch rear aluminum alloy wheels. Powerful, natural and confident braking performance is provided by 6-piston front and 4-piston rear monoblock calipers squeezing ultra-high performance carbon-ceramic brake discs. The NSX’s dial-operated Integrated Dynamic System features Quiet, Sport, Sport+ and Track modes. The system adjusts engine, motor, transmission and chassis response, as well as the engine sound level, based on the needs of the driver and driving environment. Quiet mode enables electric-only driving at lower speeds for short durations. Dynamic vehicle responses become increasingly sharp as the driver moves from Sport to Sport+ mode and, finally, to Track mode, where the NSX reveals the full spectrum of its performance capabilities. Amirul believes the ultimate driving experience lies in an all-round, hard-hitting hot hatch. 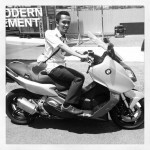 But as much as he likes to drive, Amirul prefers to put on his helmet and gloves and taste liberation by discovering the open roads on a motorcycle.